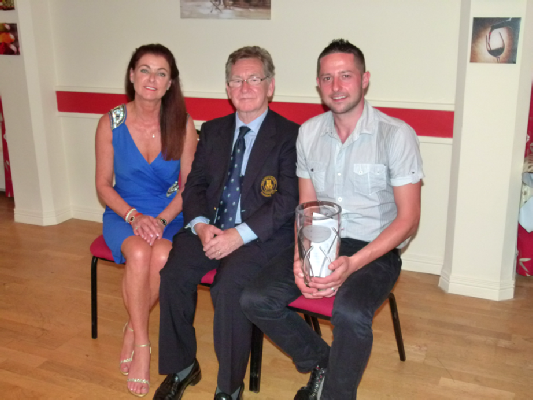 City of Derry President John Hasson and his wife Siobhan with Gary Brown winner of the President's Prize. Gary Brown (11) took home John Hasson's President's Prize with a fantastic winning 42 points. Playing in glorious weather conditions Gary was steadiness personified as he collected his first ever "Major". Ernie Heywood (2) was second on 40 points, Iain Anthony (5) was third on break of tie 39 points, Ken Quigley (18) was fourth on the same score. Category prizes, gross, 5-9, 10-17, 18-28 and veteran went to Lester Moore (1) 37 points, Cormac McKeone (5) 37 points, Paul Glackin (12), 38 points, Tommy O Neill (18) 37 points and Jack Houlahan (15) 37 points respectively. Front and back nine prizes went to Brendan Sands (20) and Andy McFaul (10) with 20 points and 21 points each respectively and break of tie. Jordan Dunn (9) 36 points and Aaron King (6) 35 points were first and second in the Juniors competition in that order. Catherine McCanny (10) was the winning lady on 41 points followed by Lucy Smyth (22) in second place on break of tie 37 points and third place went to Veronica Burke (24) on the same score. Results Report & Image: Robbie Kennelly Competitions Committee.